Magdalena is an excellent executive coach. Her knowledge, ideas and enthusiasm meant that I always had confidence in her insight and I learned a great deal from the experience. Magdalena uses a variety of innovative techniques to view situations from different perspectives and think outside of the norm. She really stretched me to dig deep, to think about and then explain what was really behind my initial thoughts. This really helped me to find out what was impeding me from overcoming specific obstacles in the workplace. 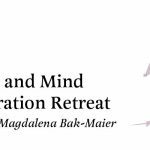 I would strongly recommend Magdalena as an executive coach.